Musician Michael Franti has co-founded a new fashionable yoga company -- that makes organic fashions and donates 10 percent to nonprofit groups. 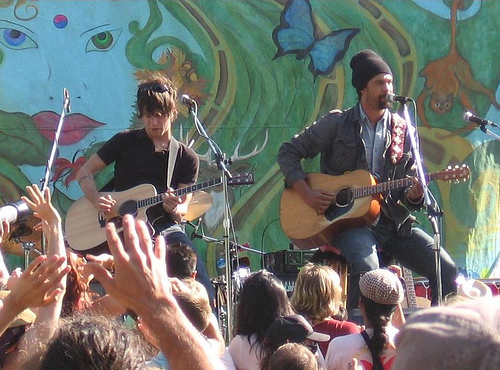 I knew Michael Franti had green leanings, since I saw him perform at a Earth Day festival in L.A. a few years back (photo below). But recently I discovered the musician's become an eco-preneur -- combining his love for the environment and yoga by co-creating an organic yoga apparel company. Called Stay Human, the eco-fashionable company offers stylish yoga clothes and accessories for men and women -- all organic, of course. You can get your entire whole outfit here -- from a green sports bra to an eco-fleece hoodie to ruched yoga shorts! Stay Human sent me its Downward Dog Pose racerback tank to try out -- and it's become one of my favorite warm weather tops. The organic cotton piece comes in a great fitted cut, complete with a shelf bra and doggie-illustrated directions for the perfect downward dog pose, in case you need a reminder! That said, I can't actually wear this racerback tank to do yoga. To the left, you'll notice that the scoopneck tank actually falls quite a bit lower on me (and that I have a great farmer's tan from CicLAvia) than it does on the model on Stay Human's website. I'll warn you -- If you're a large B cup or bigger -- prepare to pop out as you go from chatarunga to upward dog if you dare wear this top during practice! 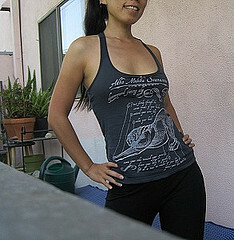 But the tank's perfect for a day out on the beach or around town -- so it still gets a lot of love from me. Want to try some of Franti's yogawear? Stay Human's having quite the organic yoga gear sale you should check out. 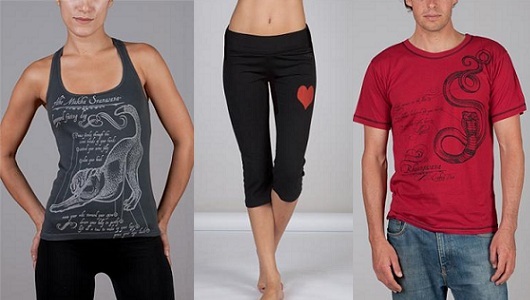 From Heart Capri Pants for $39 to Berry Red Halter Tops for $22.75, there are a lot of great organic deals. Plus, Stay Human also offers yoga-friendly accessories -- like stainless steel water bottles and even recycled note cards to send to your favorite yoga teachers. And a full 10 percent of whatever you spend will be sent to the Bumi Sehat Natural Birthing Clinic in Indonesia or Hunters Point Family in San Francisco.